Melissa, this looks wonderful! 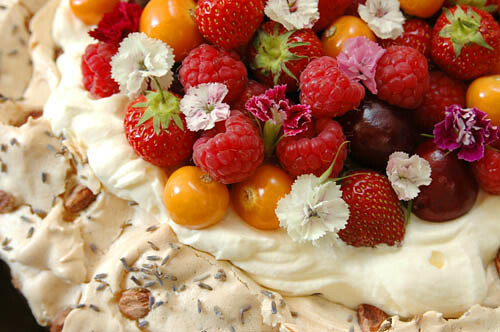 I love the addition of the lavendar in the pavlova. Very nice! Oh, wow, that top photo is awesome! Made me want to reach into the monitor and grab a slice. Wonderful post. You know, I never discovered pavlova until I married someone who spent 5 years in Australia. I always thought it was a very British-Aussie thing. Interesting to read that a chef in the Pacific-NW of the USA is making them also. Oh, my! What an exquisite creation! Elegant and gorgeous and I can just imagine the delicate meringue with the lavender. This looks exceptional! It brought back memories of travels through Oz and NZ. I recall that both of these countries claim it as their own. Either way this one is astounding–and from a great restaurant here in the States! Wow. 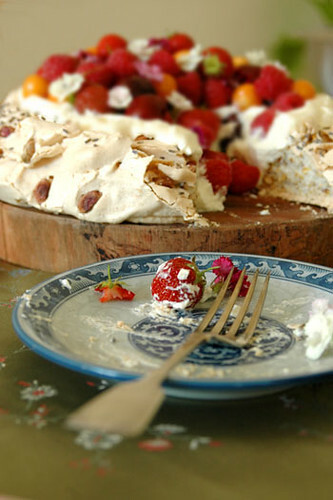 I love pavlova (it ain’t Christmas Down Under until you’ve had a slice of pav!) but have never seen it made with lavender and pistachio before.And yes, pav needs to be eaten as soon as possible after assembling. Preferably with the biggest spoon you can get your hands on.Gorgeous photos too. Both of them are magnificent. Hi Melissa, Beautiful post! Meringues are always a problem in the summer. Bakery supply stores sell silica packs to place in a air-tight container to keep all moisture away. Oh fabulous! Pavlova has been on my to-bake list ever since Zarah Maria of Food and Thoughts suggested it for my left-over egg whites. And, even better, my lavender is in full bloom. It’s so bizarre to think of Antipodean fare as “exotic”. Next thing you’ll be saying that lamingtons and Anzac biscuits are all the rage!You should do Christmas in July. Down Under they’re all the rage cos we get to have roast turkey and all the trimmings in appropriate wintery weather (altho’ yes, many people still do have a traditional baked dinner for Xmas in 40C heat. Seems like we can’t shake our English roots). hi melissa, what a very pretty pav – scent of lavender virtually wafting through my monitor. lavender, pistachio and summer berries sounds like a lovely combination…. hi melissa! i’ven’t been to the herbfarm in years, but i remember every visit–it’s every bit as delightful and picturesque as your version of their pavlova. to be frank, i’m utterly crap at making pavlova, but this is definite inspiration. Hi Melissa,I’ve never eaten a pavlova before, but it sure sounds/looks so delicious. I’d probably make this and want to eat it all by myself! Everything just looks so fresh…. Hi Santos – You are a bottomless well of culinary experience! Multiple meals at the Herbfarm, where haven’t you been? 😉 And you know, I’m sure you could make a killer pavlova if you put your mind to it.Hi Nicky – Unfortunately these were not really edible flowers! They’re called Sweet William, which are a member of the carnation family and therefore in theory edible, but these were not organic so I picked them off the pavlova before eating it. Last summer in the US I made my own wedding cake and wanted to decorate it with fresh edible flowers, and after weeks of searching I finally found an upscale supermarket that sold (expensive) little packages of edible flowers for salads. All the flower sellers I contacted said they had no source for organic flowers, and even flowers I found at the farmer’s markets weren’t organic. The only solution seems to be growing your own, or making friends with people who have a big organic garden…Hi Reid – Pavlovas are pretty new for me too. They are a bit dangerous to have around, as it’s very easy to just inhale them without realizing – luckily you’ll get your fruit quotient for the day in the process! I made a pavlova this weekend – it is THE quintessential summertime dessert in my family’s opinion. I must try pistachios next time (I’ve had success with toasted sugared almonds already). Hi Michele – Gosh, now you ask! There were (admittedly soggy) leftovers up until yesterday, but when I came home after work they were mysteriously gone. And unless a mouse got into our fridge, there’s only one other possibly guilty party – one who claims to not have a sweet tooth… Btw, if you ever see edible flowers again, do buy them as they’re quite hard to find, and many have very interesting flavors ranging from spicy to downright floral. They’re fantastic (and beautiful) in salads. I would have to say that is one of the nicest looking pavs I have seen 🙂 I am abit unaustralian in that I like mine abit chewy in the centre rather than just fluffy eggwhite. I love the Herbfarm cookbook – I’ve read it twice and only cooked from it once or twice. Thanks for the pavlova reference. Meringues scare me – perhaps due to a frightful Baked Alaska experience? A winner recipe from the Herbfarm cookbook is the roasted vegetable ratatouille. It calls for handfuls of fresh herbs which I fortunately have in my garden – despite my black thumb-like efforts. It is savory, lip-smacking and popular with non-vegetarians, too. Hi AmyBee – Thanks for the tip – I do love ratatouille! Funnily enough I’ve run across a lot of people who are scared of meringues – I guess it just takes one disaster to permanently scar you. That happened to me with caramel, as the first time I ever tried to make it I burned it (and myself!) badly. But meringues are so easy – do give them another shot when you’re feeling brave! This pavlova is just beautiful!